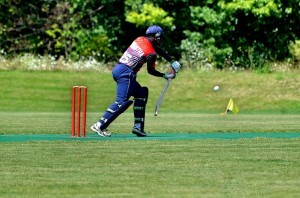 Smart Choice downed Somerset Cricket Club to cap off an improbable victory at the 2014 Niagara Cricket & Bollywood Festival. Houston-based Smart Choice’s campaign got off to a slow start when they were downed in the first game, but rebounded to win each of their following games and claim the top purse of $20,000. Smart Choice fielded a shotgun roster for the event blending their core team members with some of the top Canadian players to help adjust for uniquely Canadian weather and playing conditions. The festival was a resounding success. Close to 1000 people went to the grounds during the event from as far as India and as close as Niagara. Close to 200,000 people joined the conversation about the event online through the Festival websites, social media outlets, pre-event radio interviews, TV shows and live streaming of all main event games. Brampton’s JusReign, one of Canada’s top up and coming South Asian comedians, served as the concert MC that included performances from Broken Dance Group – the top rated Bollywood dance group in Canada. The concert also featured live performances from Teji Sandhu, Happy Armaan, Rehmat, The Avengers Group and Prag Rey.